Forget that bottled store bought BBQ sauce full of high fructose corn syrup and goodness knows what else, and indulge instead in this fruity naturally sweetened fresh peach bbq sauce. It offers a sweetness from fresh peaches, a bright tang of apple cider vinegar and a smokiness from smoked paprika. Use it on wings, with some shredded chicken or slather it on your next batch of ribs. Summer is here! When I first started cutting back on processed foods, I searched high and low for a good sugar free bbq sauce, but it just didn’t seem to exist. Or if it did I certainly couldn’t find it. So I did what all desperate people do, and I started making my own. I started off making the clean eating bbq sauce from the 100 Days of Real Food cookbook, and have made MANY variations since then. 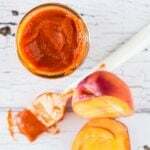 This simple paleo peach bbq sauce is hands down my favorite so far. It helps that it uses up all the peaches from my trees in summer! Add all the ingredients to a large saucepan and heat until thickened. I always make a double batch and freeze some in mason jars for use throughout the year. Just pull it out the day before you plan to use it, and hey presto, you have some delicious peach bbq sauce to liven up any meal. How Do You Enjoy Peach BBQ Sauce? it can even be watered down as used as a dressing in a southwestern style salad. Puree in a high speed blender until desired consistency is reached. BBQ Chicken Tostadas from Cupcakes and Kale Chips. In a large saucepan, heat olive oil over medium heat. Add the onion and cook until soft, about 5 minutes. Add the minced garlic and peaches and cook for another 2 minutes. Reduce the heat to low and add the apple cider vinegar, tomato paste, lemon juice, paprika, mustard, salt and pepper. Give everything a good stir until it is relatively smooth. Simmer for around 5 minutes, until the mixture has thickened. Remove from heat. Using an immersion blender or a high powered blender, blend until smooth. This is just what I was looking for 😀 Sounds absolutely perfect. I love that is all natural and without added sugars. I also love the addition of ginger. Sooo good. Can’t wait to try this next weekend. I love fresh peaches, always look for new recipes with them, Your Peach bbq sauce sounds delicious excellent for grilling. I am going to make some for before the summer ends. My boys are HUGE BBQ fans. I’ll have to give this one a try next time we are planning BBQ in our meal plan. What a great way to use all those peaches! I’d use this as a dipping sauce in addition to bbq’ing the meat in it! Hello pork! Hello chicken! Looks amazing! 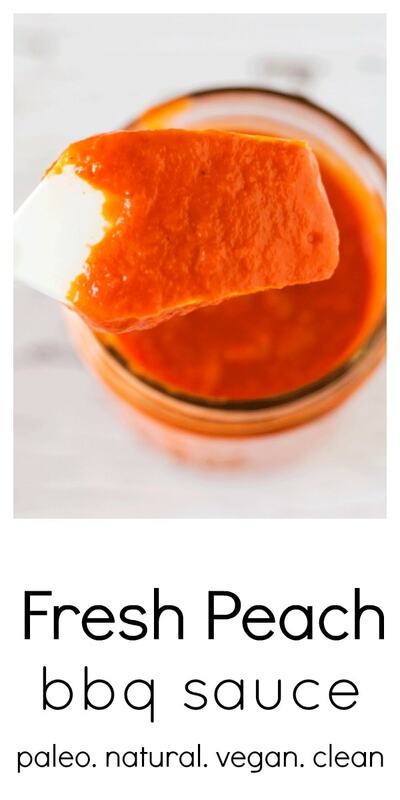 I really enjoy making my own sauce and this recipe is extra nice because it’s naturally sweetened with fruit. I’d love to give this a try using strawberries. That looks so pretty. Love the bright beautiful color. Nothing beats homemade especially when it’s condiments like these sauces, dips and such. The flavors sound wonderful and perfect combination of sweet and tart. We would enjoy this for sure. I love sweet barcbecue its the best on Salmon/ I must go out and salmon now to try this recipe I am sure it will be perfect! What a delicious looking sauce. Frankly, I don’t like store sauces — they taste phony to me. Now this barbecue sauce would be perfect with any of the meats we like to grill. We’re having chicken this coming week and this sauce would be ideal. This is the perfect sauce for chicken, shrimps and even pork. Homemade BBQ sauces are always so good. The flavour is so intense….and it easier to do than most people think. This would make a great BBQ party gift! !